Hanuman is the prime devotee of Lord Rama. He is the embodiment of courage, strength and devotion. 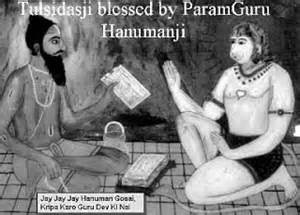 The Hanuman Chalisa is a collection of 40 verses by Saint Tulsidas, in which he talks about Hanuman’s devotion to Lord Rama, his courage, strength, appearance, His role in the Ramayana, and the need for His blessings to devotees. Chanting the Chalisa gives a lot of internal strength to the devotees and when chanting it 108 times in single day, the devotee has his wishes fulfilled. The Chalisa is written in such simple style, that even people who are new to this text find it easy to read or follow. Saturday at the temple please join in at least for a little while to read or chant this beautiful hymn along with other devotees, 1:00-7:00 pm. Abhishekam and Archana at 7:00 pm to Lord Hanumanji.Devotees may bring fruits, flowers, prasad to offer for Lord Hanumanji.